Let learners search for solutions to problems. Review subject matter in a question-and-answer format. 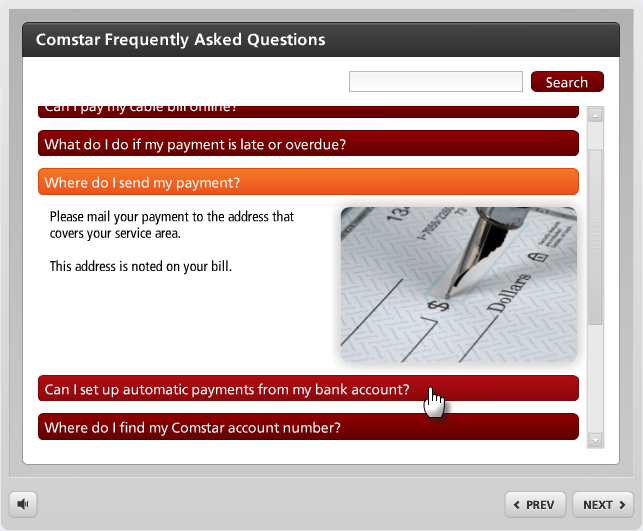 Steps: Located on the left side of the screen, this panel is used to manage questions for the FAQ interaction. 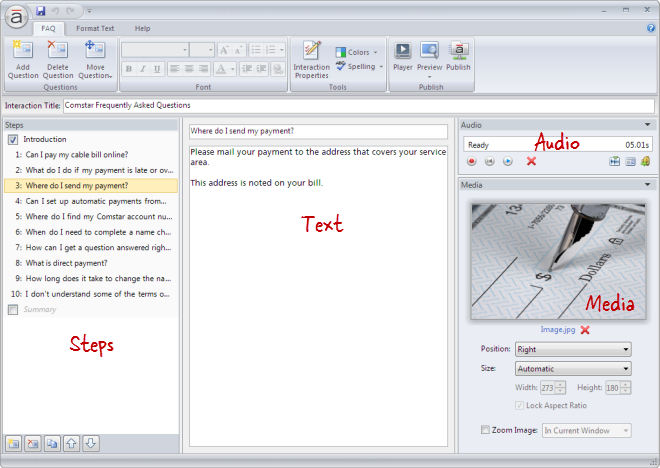 Text: Located in the middle of the screen, this panel is used to add text to each question. Go to the FAQ tab on the ribbon, and click Add Question. 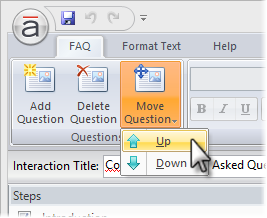 Click the Duplicate button at the bottom of the Steps panel to copy the currently selected question(s). 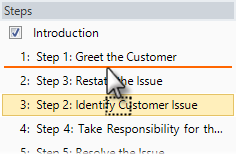 New questions get added just below the question that's currently selected in the Steps panel—unless the summary is selected, in which case new questions get added above it. Tip: FAQ interactions can have an unlimited number of steps. 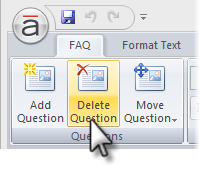 Double-click the question in the Steps panel to open it for editing. Enter the new question text, and press the Enter key. 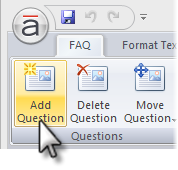 Select the question in the Steps panel, and type the new question text in the title field at the top of the text panel. Drag them to a new location in the list. An orange line will move with your mouse to indicate where the questions will be when your mouse is released. Go to the FAQ tab on the ribbon, click Move Question, and select either Up or Down. Note: The introduction and summary can't be moved. Go to the FAQ tab on the ribbon, and click Delete Question. 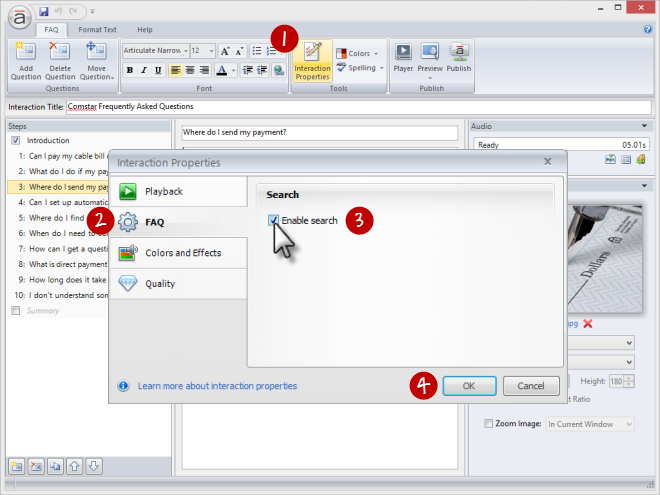 Articulate Engage gives you the option of adding a search field to your FAQ interaction. The search field makes navigating lengthy interactions easier. When enabled, it appears in the upper right corner of your published interaction. Go to the FAQ tab on the ribbon, and click Interaction Properties. Select the FAQ tab on the left side of the window. Mark the box to Enable search. Are Scrolling Panels in Your E-Learning Bag of Tricks? They Should Be!